Back in 2016, I had the privilege of interviewing Cory Lavine. So I was delighted to have the opportunity to review his album Out of the Blue for Enlightened Piano Radio. Read on to find out more about Cory’s beautiful solo piano music! 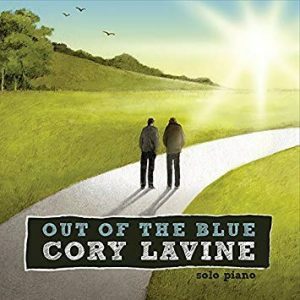 Out of the Blue is the debut album of pianist Cory Lavine. Released in 2015, this album contains nine delightful solo pieces representing steps along Lavine’s path towards becoming a solo piano artist. Lavine began his classical music study at age nine and continued for six years; after graduating from high school, he spent about a year touring the country with a rock band before returning home to New York where he received degrees in music and sociology from St. Lawrence University. Later he studied recording and sound engineering in Tempe, Arizona; that training resulted in an internship at the Gaylord Opryland Hotel, where he worked for several years setting up sound equipment for meetings and conventions. Although a change in company contracts eliminated that job, he decided to stay in Nashville and continues to work at the hotel as a bellman to this day. He has enjoyed tremendous success in this capacity, being chosen from among nearly ten thousand employees to win one of seven top service awards, but a chance encounter with a guest of the hotel in 2009 led Cory to believe that it was time to get back to music as well. So it came as no surprise when, upon returning from a walk one day, he sat down at his keyboard and recorded what would become the title track, Out of the Blue, as it also seemed also to come out of nowhere. Cory’s music has a sound like no one else’s. It is light and melodic, playful and flowing, sunny and unpretentious. The album opens with Riding the Wind, an ebullient number that ebbs and flows like the pushes and pulls of life. 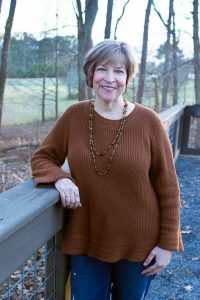 Give Thanks, its beautiful right hand melody accompanied by a gentle broken chord accompaniment, tells the story of Lavine’s experience meeting a very young child at the Gaylord Opryland Hotel, whose honesty, simplicity and attitude of gratitude inspiring Lavine to maintain a his own childlike sense of wonder. The pace slows a bit with the soulful Andante. An expression of a yearning for a simpler, quieter way of life, this piece is a personal favorite. Child’s Wish pays tribute to a terminally ill child whose dying wish was to visit the Grand Ole Opry; Lavine met her and her family during their stay at the Gaylord Opryland Hotel. The child’s bright smile and cheerful demeanor inspired Lavine to compose this poignant, wistful piece. Next, the ethereal Fly Away will transport you to your mental “happy place” wherever it might be. Played mostly in the upper registers of the piano, it is effervescent and sparkling and is another piece I can listen to again and again. New Day, with its joyful melody, luscious chords, and resonant bass, reminds us to find joy in the opportunity for making a fresh start every new day brings. Similarly, the lilting and exuberant Little Dance calls upon each of us to make the most of the “dance” that is our life – to dance like nobody’s watching, as the saying goes. The final track, Reminiscing, provides a perfect conclusion to the album and provides us with the opportunity to reflect upon memories from the past as well as contemplate our hopes for the future. Cory was awarded Best New Artist of 2016 from Enlightened Piano Radio and it is easy to see why. Running approximately thirty minutes, this album definitely left me wanting to hear more from this talented composer whose music obviously wells straight from his heart. Very highly recommended!